Here we are at the beginning of March, and February has just passed me by!! We took a fun trip at the beginning of the month to Maui – which was supposed to be our escape from the gray, wet skies of the Western Washington winter. I was surprised at how much it rained on Maui and how many days started with clouds, gray skies, and sprinkles. I guess this is pretty typical for “winter” weather there, but it was just a teeny bit disappointing. Please remember you can click on any of the photos to make them larger. 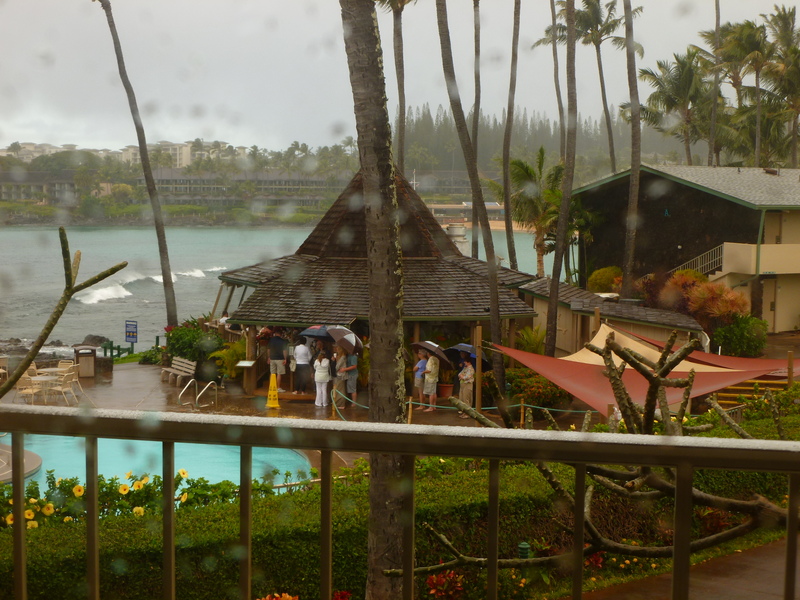 Above is the view from our lanai. You see the “famous” Gazebo restaurant which is open for breakfast and lunch daily. This was (obviously) a rainy morning, and the line is short. Most days the wait was about 45 minutes. We went one morning to try the macadamia nut pancakes that we had read online were nothing short of spectacular. I have to say I was less than impressed. They simply sprinkled some chopped mac-nuts on top of your basic pancake and called it good. Oh well, I’m not really a pancake connoisseur, so maybe my two cents worth is just that – worth but two cents! 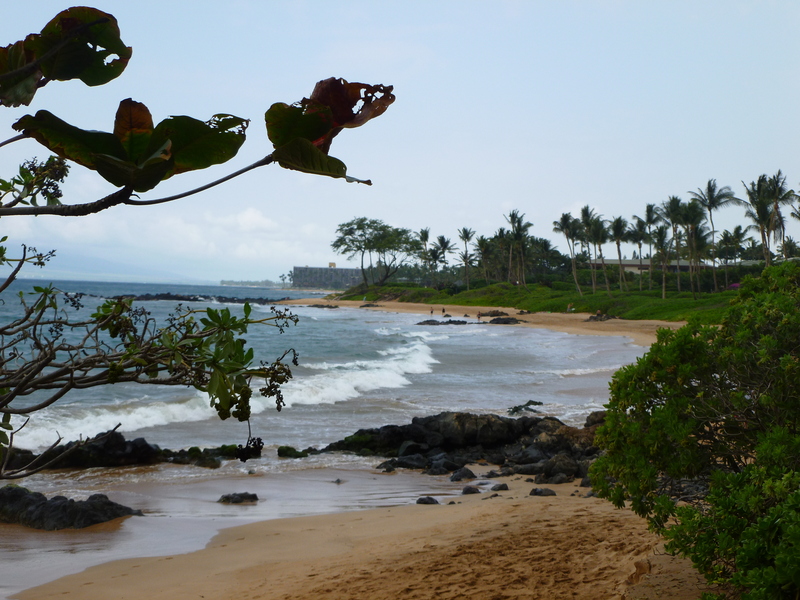 Here we have a view of one of the south Maui beaches near Makena. 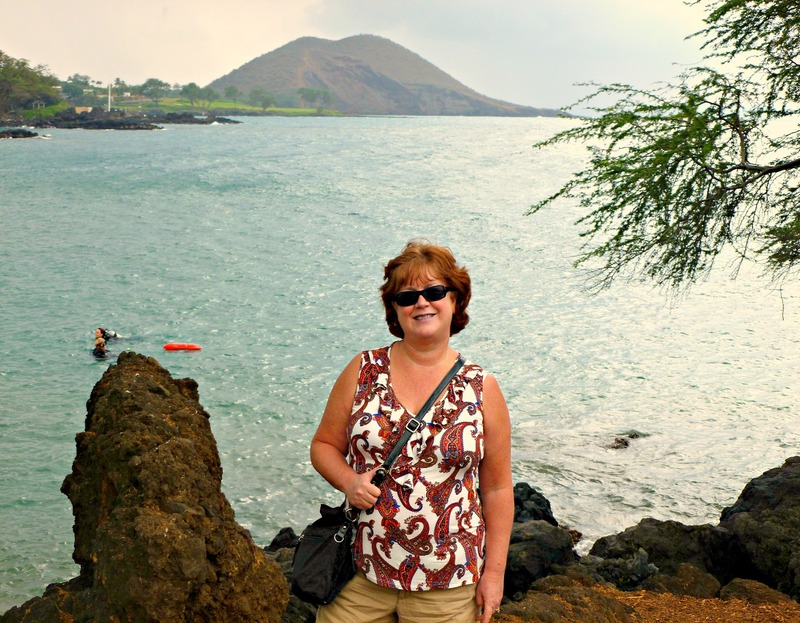 We enjoyed our drive down the coastline thru Kihei and Wailea even though it was not exactly bright and sunny. This time of year the Humpback whales put on a show every day if you just sit patiently and watch. 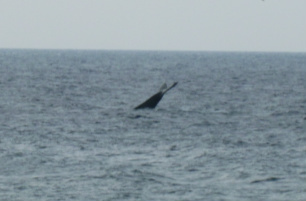 I tried SO hard to get some good whale pictures, but alas, the one below is about as good as it got. We did go snorkeling (my favorite thing to do on earth!!) a couple of times and also tried to find a kayak trip that would suit us, but failed on that. I guess we knew we’d never top the March 2011 kayak trip where the whales literally swam right under our boats… so we didn’t try too hard. Silly, I know. Kayaking is such fun and especially in Hawaii – I’m sorry now we didn’t pursue that a little harder. 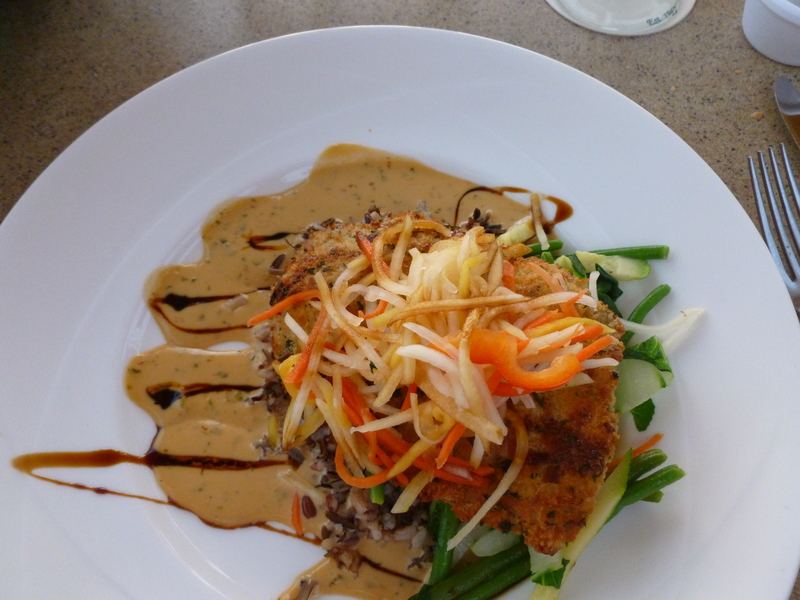 We managed to consume a few delightful meals on this trip, and yeah, I’m one of those crazy people who like to take photos of their food. 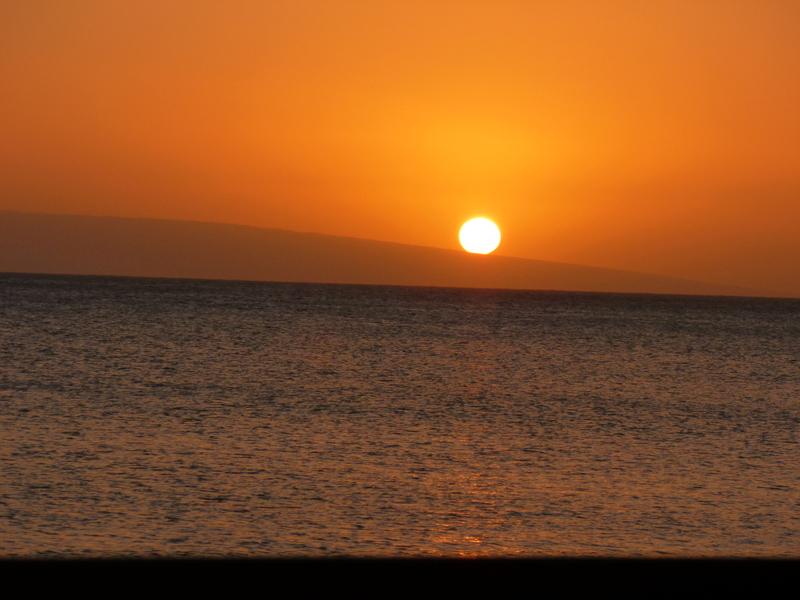 To prove we actually did see the sun, here was the sunset one evening, dipping down beyond the island of Lanai in the distance. The sunsets in Hawaii are spectacular, in my humble opinion. One beautiful sunny day we decided to drive up to the top of Mt Haleakala, which you can see by Hubby pointing it out, is 10,023 feet. Lots of crazy adventurous folks get up waaaaay before dawn to get to the top of the mountain to watch the sunrise. This was not something on my to-do list (getting up at 3 am, I mean), so we drove up during the day. It was gorgeous up there. 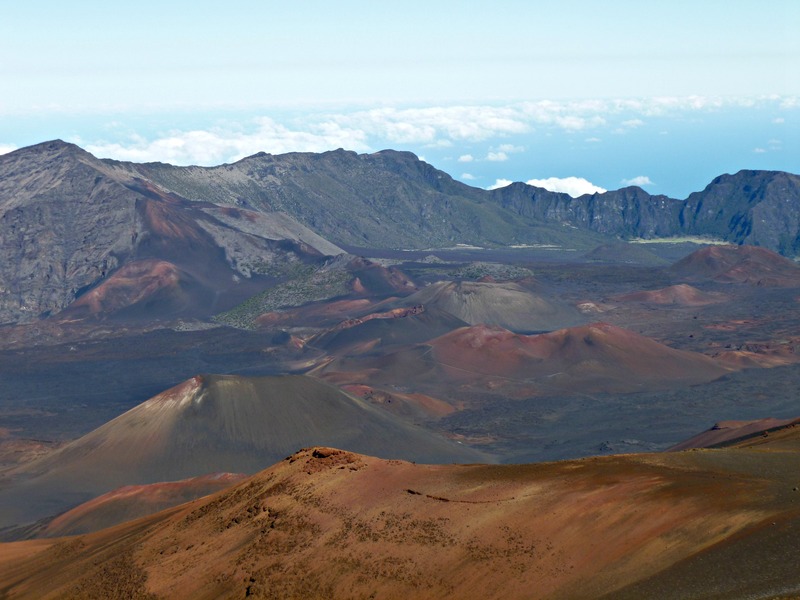 Here’s a view showing the cinder cones (I think that’s what they called them) in the dormant volcano, Haleakala. We’ve learned a lot about volcanoes recently, having been to Mt St Helens last summer and now here to Haleakala National Park. Couldn’t resist sharing this photo we took while gazing down onto Honolua Bay (a place we later snorkeled ourselves). 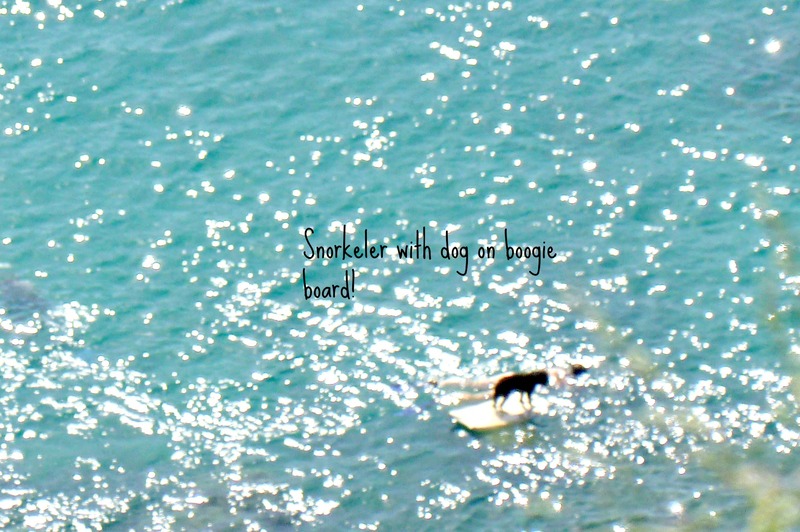 Here was a guy, snorkeling with his dog on a boogie board! It was a rather hot that day and I worried that the dog would get overheated, but he seemed to be having a great time. Here’s a snap of the condo complex we stayed in called Napili Shores. While it wasn’t my favorite place we’ve ever stayed (rather noisy, believe it or not!) we did like it. 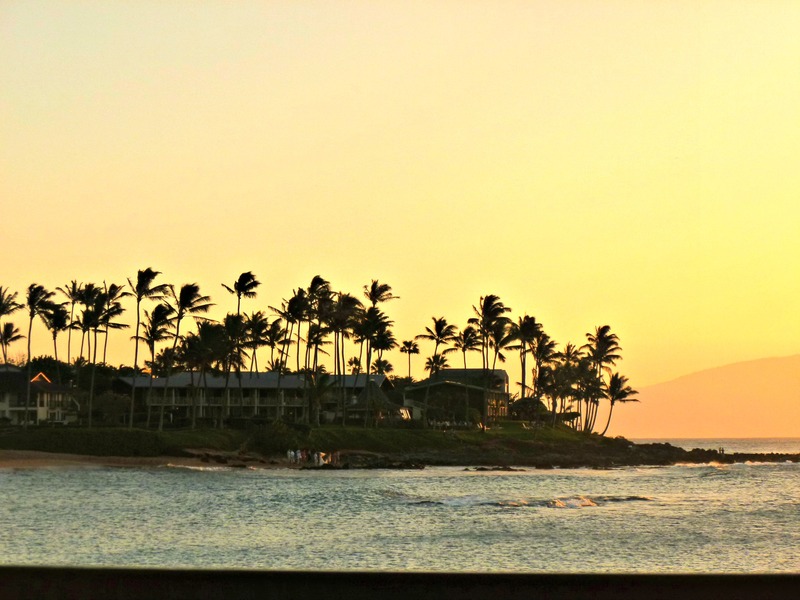 This was taken across Napili Bay from the Seahouse Restaurant, looking back towards the condo near sunset. I did love hearing the crashing of the waves, day and night. 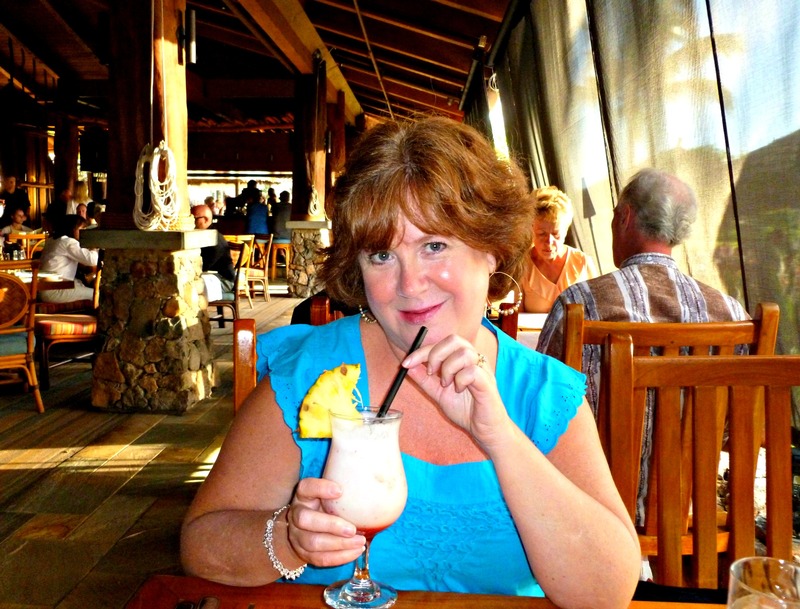 Here I am at Dukes in Ka’anapali (a totally open air restaurant – love it!) trying my very first “LavaFlow” drink. It’s sort of like a pina`colada with some swirled strawberries thrown in. Very yummy. I hope to have another…. someday 🙂 This was taken on Super Bowl Sunday. We could hear lots of folks in the bar hooping and hollering and most sounded like they were for San Francisco…. they seemed pretty unhappy with the the outcome of the game. I was oblivious to football on this trip… just too happy to be in Hawaii, I guess. This photo was taken the evening before we left beautiful Maui – at Lahaina harbor. Another stunning sunset and a great little trip. But, like I always say, there’s just “no place like home”… it was great to go, but just as great to arrive home safely. Hope you enjoyed our little Hawaiian pictorial. 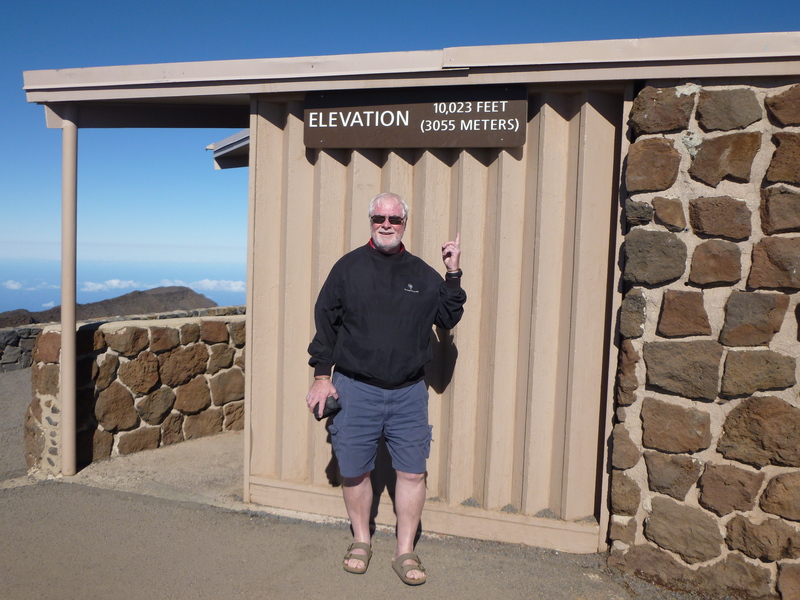 This entry was posted in General Musings and tagged Haleakala, hawaii, Lahaina, Maui, Napili. Bookmark the permalink. 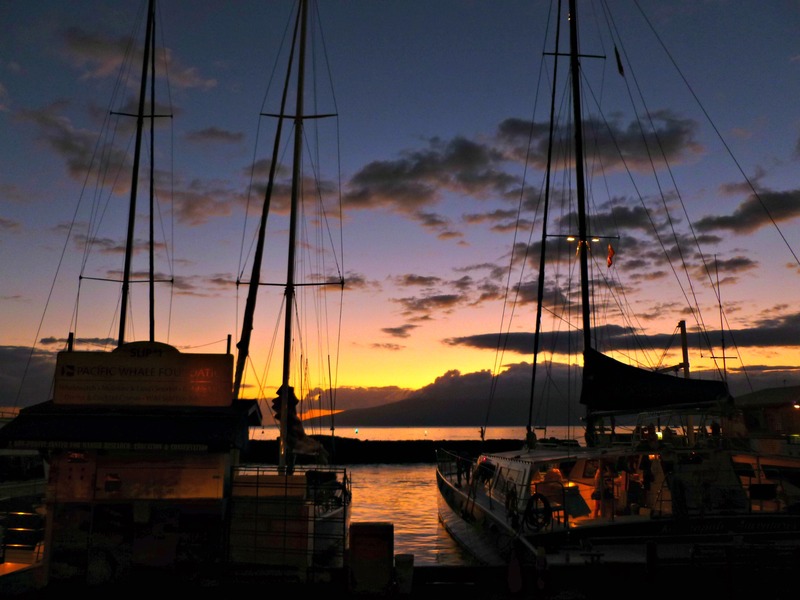 So loved your account of your time in Maui…………loved the photos and the last one of the boats in the sunset………….wow………….world class shot ! !